Mountain views. No street noise. A fantastic location. Interested? I thought so! This could be your next condo in Breckenridge, Colorado. You’ve got to see it to believe this amazing condo. 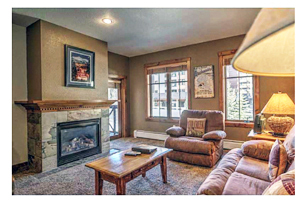 This is hands-down one of the nicest condos for sale in Breckenridge, CO right now. From its fully furnished interior and prime location–just walking distance to the slopes or to downtown, you simply can’t go wrong with this gorgeous condo. Plus, the garage is heated and you can enjoy luxurious amenities such as the pool and hot tubs. If you want a relaxing home, where you can leave all the stress of life behind, seriously consider this beauty. Have I told you yet about how quiet it is here? Nothing will distract you from peaceful evenings in front of the fire in your elegant condo. The best part is that even though it’s a one-bedroom, this condo is spacious enough to entertain and host overnight guests, and the finishing touches will be sure to impress your guests. From the dark wood finish of the kitchen cabinets and the doors to the stone countertops, the quality of this condo is apparent from the moment you enter. If you’re looking for a vacation condo, an investment property or a place to call home, you should schedule a showing to see this condo. I have a feeling it will end up on your ‘keep’ list. As you can tell, this fantastic condo in Breckenridge has so many qualities that make it an outstanding property. If you’d like to tour this place in person, just let me know. I can arrange a showing whenever you’re ready. Give me a call and I’ll set up a time that works around your schedule. Also, if you’re searching for a different type of property in Breckenridge or throughout Summit County, I’m happy to put together a portfolio of listings that might meet your needs. You’re always welcome to start by looking through the updated listings on my website, and when you’re ready to discuss your options or prepare for showings, contact me at any time via email ([email protected]) or on my office line. I look forward to working with you to find your perfect home.